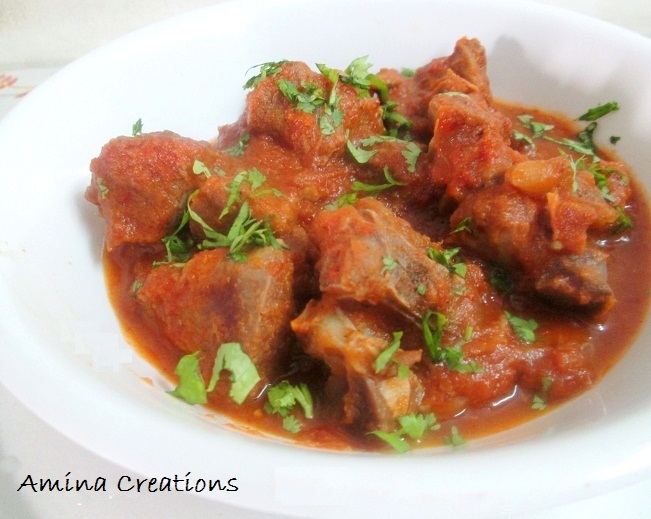 This is a delicious and spicy mutton gravy made using ground onions and tomatoes. Laal maas is best served with Chicken Biryani or as a side dish with roti or rice. Heat 1 1/2 tbsp oil in a cooker, add cardamom, cinnamon and sauté for a few seconds. Next add the chopped tomatoes and sauté till they are soft and oil starts separating. Transfer the cooked tomatoes, cardamom and cinnamon (without oil) to a mixer jar and grind to a paste. Now add the remaining oil to the cooker, add the ground onions and sauté for a couple of minutes. Add garlic and ginger paste and sauté till the raw smell goes. Next add red chilli powder, salt and mix well. Add the pureed tomatoes and chopped coriander leaves. Once done, check if the mutton is cooked. Add chicken 65 masala and mix well. Cook again for a few minutes till the gravy starts thickening. Garnish with chopped coriander leaves and serve hot with Biryani and raita.